I'm excited to finally show some of the first pieces of the Glitches & Stitches collection I've been working on for the past couple of months, now available at Jumeirah Mosque's Majlis shop and selected Arte & Ripe markets around Dubai. As you can see, I've been finding my new home int the UAE very inspiring, along with its camels, date trees, desert dunes & iconic Burj Al Arab! 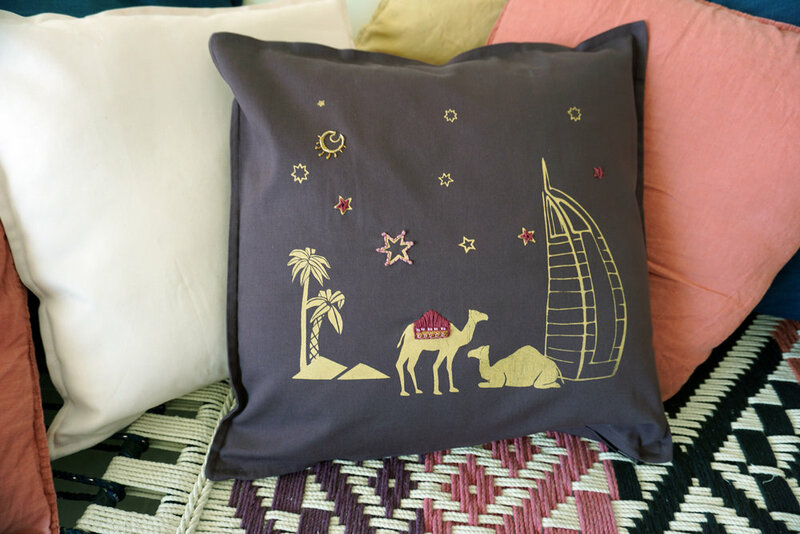 Each cushion was manually screen printed and intricately embroidered by hand with slightly different patterns, colors & beads. The beauty of these techniques is that each cushion comes out slightly different, making them all unique, one-of-a-kind pieces. For me, with my background in mass market fashion design, these small "glitches and stitches" are precisely give handmade products the soul & charisma I've been missing. This design comes in the four background colors below (Black, Light Pink, Dusty Plum & Brick Red) and feature removable covers for easy care & polyester filling is included. Each cushion being unique, please send purchase inquiries to hello@glitchesandstitches.com to for photos of available patterns for each color. If you're interested in hearing about my next market dates, workshops & other events, sign up for the newsletter below or follow our facebook page!